What is the proper etiquette for the timing on sending them out? See, I ask this because we waited like 4 months to send ours out. Not because we’re lazy, lol, but after we got married we were super busy! Someone told me you could wait up to a year to send them out, but I just think that’s tacky, I felt bad waiting 4 months! 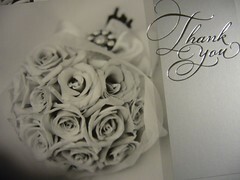 I recently got a thank you card within 3 weeks of the wedding – I was VERY impressed!